HONDA has just released details of its updated MSX125, which has been given styling changes and a new exhaust for 2016. Honda says the updated styling make the MSX look more like a ‘mini-streetfighter’. That might be a bit of an exaggeration, but the 2016 MSX125 has definitely got some new-found attitude courtesy of its restyled top half, which has side panels that integrate with the fuel tank to create sharper, more angular lines. 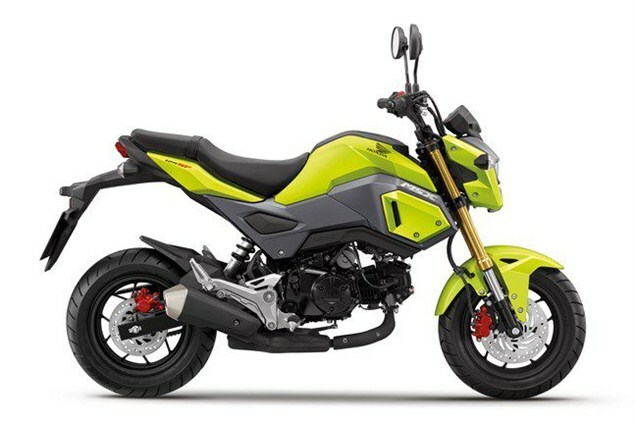 The new stacked LED headlight also contributes to the styling update, giving the 'Grom' a more contemporary face. Other changes include a new shorter, underslung exhaust, upswept tail unit with LED tail light and a higher pillion seat. The new seat unit means the MSX has a new frame structure courtesy of its steel mono-backbone frame. It’s available in four colours: ‘Matt Axis Grey Metallic’, ‘Pearl Himalayas White’, ‘Pearl Valentine Red’ and ‘Lemon Ice Yellow’ and will be in dealers soon.